Tonight TMB & PRB Entertainment presented “Fight Nite at the Scottish Rite”, an eight-bout event that took place at the Scottish Rite Theatre in San Antonio, TX. 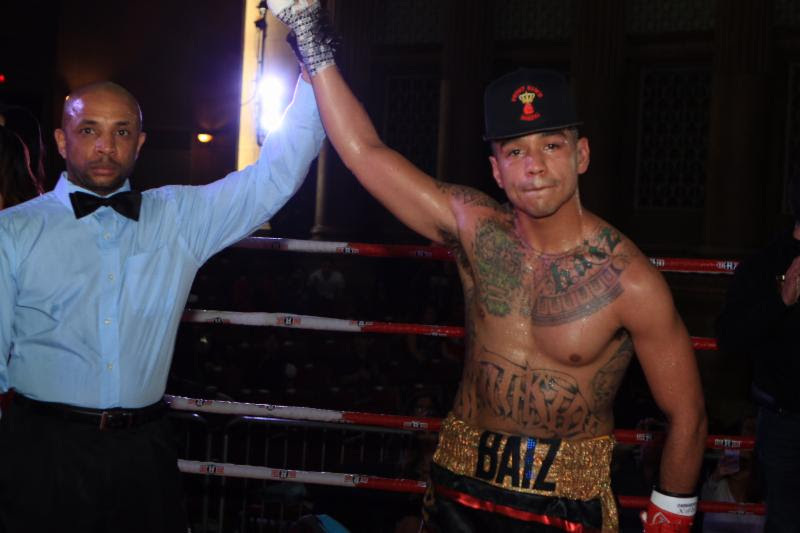 In the four-round main event, Daniel “Da Beast” Biaz (11-1, 5 KOs) scored a unanimous decision over, Ray “The Warrior” Trujillo (3-4-1, 2 KOs). Biaz, a southpaw who is managed by Prince Ranch Boxing, wobbled Trujillo in every round, with hard shots to the head. Trujillo was trying to force his way into the chest of Biaz throughout the fight, but was unsuccessful as he was countered with by accurate punches. Trujillo, who was a last-minute replacement, showed a lot of heart but was outgunned by Biaz, who landed the cleaner blows. Scorecards read 40-36 across the board, all in favor of Biaz. In the six round co-main event, female bantamweights, Brianna “Queen Bee” Gonzalez (3-1, 1 KO) and Brittny “Mi Vida Loca” Ordonez (2-2, 1 KO) went toe-to-toe for six hard fought rounds. Both fighters were going for the knockout from the opening bell. Gonzalez was edging out Ordonez in every round as she landed more power shots. Ordonez was giving it her all, but it was Gonzalez who pulled out the unanimous victory. Scorecards read 58-56, 60-54, 59-55 all in favor of Gonzalez. After a two-year layoff, Prince Ranch Boxing’s Victor Pasillas, shook of the rust with a spectacular performance. Pasillas used his superior boxing skills to land his shots. Moreno was backing up the whole fight as Pasillas was on the attack. A left uppercut to the body sent Moreno to the canvas in round two. Pasillas continued to apply pressure as he forced Moreno to take a knee in round four. Moreno got up but did not come out for the fifth round. Pasillas scores a TKO. Local fighter Luis Villarreal, went the distance with Adam Castillo in a four-round bout. Both fighters were feeling each other out in the early rounds, but it was Villarreal who was the more active fighter. Villarreal came on strong in the final round landing hard body shots, forcing Castillo into survival mode. Villarreal won by unanimous decision. Scorecards read across the board 40-36. Bayardo, who was making pro debut, was out gunned by the more experienced Holgiun. Bayardo came out throwing wild punches, while Holgiun stayed composed. Holgiun landed a couple of hard right hooks before dropping Bayardo with a devastating uppercut. Bayardo got up but did not want to continue. The bout was stopped at the 1:45 mark of round one. Local native Tyrell “Too Real” Herndon went to war with fellow statesman Armando Herrera. Herndon used good footwork to set up his power shots. Herndon landed two powerful body shots followed by a right hook that sent Herrera to the canvas at the end of round one. In round two, Herrera showed a lot of heart as he kept coming forward trying to land some power shots of his own, but was not successful. In the beginning of round three, Herndon landed a counter right cross flush on the face of Herrera, putting him down. Herndon then landed a plethora of punches to the head and body of Herrera after he got up. Finally, Herndon ended the fight with another flurry of blows at the 1:06 mark of round three. Ben Guerrero, who was making his pro debut at age 51, was no match for the young lion, Gregory “Goyo” Morales. Guerrero came out guns blazing at the opening bell, but ran into a buzz saw, as Morales landed some viscous counter blows. A double left hook-straight right combo blasted Guerrero who was out on his feet, forcing the referee to stop the bout at the .46 second mark of round one. In a battle of local lightweights, Frank “Bloodhound” Brown dominated Daniel Sanchez from the opening bell. Brown displayed a vicious body attack while landing at will to the head of Sanchez. A left hook to the head put Sanchez on the deck in the early part of round two before the referee stopped the bout after a barrage of punches. Fight was stopped at the 2:22 mark of round two.